How lucky I was to win the IPhone at the end of the 6th National Digital Conference at Old Billingsgate last Thursday! Last year I tweeted and attended the conference virtually on the web. As a Race Online Digital Champion, this year I attended the conference in Real Life. My next posts will be about my experiences in starting to use a new Iphone4. I have never used any Apple products, I do not "do" mobiles and I try to use one platform for each of my web applications. The IPhone has changed all that. It has been a steep learning curve. The first challenge was to get started and to get used to the new interface,"my fingers". Even the Sim Card was a challenge as the little drawer where you put the Sim Card is now on the right hand side of the Iphone. More trouble because I have a 64-bit Windows computer and Apple users normally use 32-bit machines. I had to find a special version of ITunes which is the driver for my Iphone. Every day now, I can plug the Iphone into the computer so that the Iphone is sychronised with my computer by using ITunes. So I have made a good start and Kenny from 3 has helped me to set up the free One-Plan that I won with the computer. 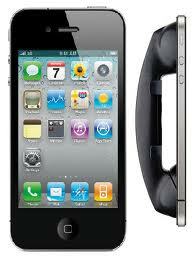 I can now use the telephone, I can use Skype and I have added another VoiceMail application called Viber. I ought to be OK but unfortunately, there is no 3G reception in my home. The Iphone will be fine when I am travelling but at home I will be using Wifi with Skype or Viber. I have made a good start and I look forward to many happy hours. I will blog about my further progress As Iphone4 says "IT HAS CHANGED EVERYTHING"!!" As a consultant, I am involved in several projects, where social media are used within an online community. One of these is Begrand, a website, supported by the government for grandparents, where I am on the Advisory Board. In the picture, I had just met the Green Goddess, Diana Moran on the Begrand stand at the Retirement Show. She invited me to join one of her exercise classes. Begrand use their own website building tools and so they are quickly able to respond to my suggestions to adapt their website. This is rewarding work. Recently, I suggested that grandparents need more help to know the meanings of the headings on the Main Menu. Now when you hover over the icons with your mouse, there is help for you to decide whether to click or not. I find this rewarding work. For some of this work, I can manage with the broadband speeds that I get at home but there are no chat rooms, no video conferencing and no videos to help members to use the site. Begrand are unable expect that their users to get a speed that is sufficient for such applications and they are reluctant to add goodies that cannot be used by most of their members. I have been invited to comment on a questionnaire from the West Sussex County Council on the ways in which I personally use Broadband and why I need a faster service. They have provided 13 possible uses and so I will examine these in my next posts. The title of my blog has been changed from The Broadband Revolution to My Broadband Revolution. My blog has always been about the ways in which Broadband has changed my life. Now, I also publish a daily paper about Broadband which contains articles from all over the world about Broadband and so The Broadband Revolution is now the story of changes in the rest of the world. Why I want Next Generation Access (NGA) Broadband? For the Family. Did you see the BBC video about the launch of Virgin Media? My 13 year old neighbour tells me that it is OK when he is on line alone but no use when the rest of the family are on line and want to multitask. For Consultations. Telemedicine is developing fast in rural areas and in most medical consultation you are not touched. But why not other sorts of consultation on line? For Video Conferencing Many of us are excited about Skype because you can see who you are talking to. I want to look around the room, share photos and videos as we talk and invite other members of the family to join in. Video Conferencing will also transform talks and lectures in all sorts of ways. For my Old Age. As I watch people get older, they do less. I really can look forward to doing as much as before as long as I can keep up with the each new opportunity. My great great grandfather was just 26 when he invited five of his friends to bring oxen to Brighton. With a team of 80 oxen, they were able to drag the postmill a distance of two miles and later they undertook some longer journeys. 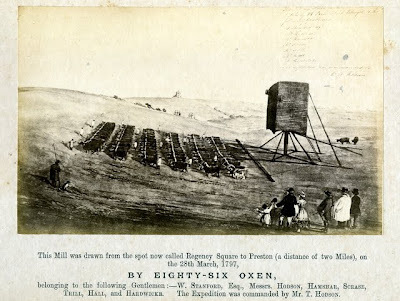 Mills had to be moved when houses were being built in Brighton and no longer was there sufficent wind. The event is recorded in this extract for Sussex in Bygone Days (1906) Reminiscences of Dr Nathaniel Blaker (1835-1921) about the oxen in Sussex c1845. "Ox-Teams in my younger days were considered essential and most important indeed on the South Downs, at all events, almost as much agricultural work was done by oxen as by horses......."
In Greek mythology, Janus is the God of beginnings and endings and so Janus, after whom January was named, has two faces, looking forward and looking back. My posts have not been very regular during the last few weeks and my New Year's resolution is to blog more regularly. I have been given a wonderful Christmas present. My first video camera is a little gadget like a mobile telephone called a Flip video. The new version of Picasa, Picasa 3, has a new feature that enables you to store your videos with your other pictures and to edit them. I do not often get excited about videos but this video is awesome. I had forgotten that when I signed up to UTube, I had also recorded a few of my favourite videos and so I was pleased to see a message from UTube this morning in order to say that one of my favourites had been updated. I was also sent some text so that I could embed it in this posting and share it with you easily. I am a compulsive puzzle and problem solver and the Books part of the Times on Saturday keeps me going for a long time. Today I got stuck on the last clue of the simple crossword. 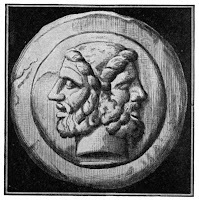 Eventually, being unable to solve "ornamental knots", I googled "list of knots" and found the Turk's Head, which is illustrated here. A reader has recommended the following two sites for solving crossword puzzles. The Crossword Solver lets you search for words where you know some of the letters and I use if also for the Codeword, where numbers represent letters. OneLook's Reverse dictionary lets you describe a concept and get back a list of words and phrases related to that concept. I have just found a site called Crossword Bebop that will keep me interested for a long while. It includes a good video on Twitter. This is my fortieth post and it is time to draw breath. My last fourteen posts have all been about social web sites. When I began writing about social web sites, I did not know where I was going. I was being buffeted along by all the web providers, Google, Microsoft, BT etc, who all want to sell us their services. Now I am a bit clearer. Social web sites are all sites for sharing things. We all have to make decisions about what we may want to share. There are some cautionary tales about Facebook and other social web sites where people have begun to share more than they intended. My ideas are evolving as I talk to people on and off the web. One friend of mine asks "Why should I want to share any information on the web" What you share will be a personal decision but it is worth looking at some of the new opportunities. You might begin by considering if you would like to share your rubbish as in Freecycle. They say that Twitter will replace Blogging and Blogging will be a passing phase. Twittering is new to me. I have been getting my first Tweet from Radio 4, but I only have one friend to send my tweets to. When I get a tweet from Radio 4 is good, I am alerted to a recent item in a Radio 4 programme and I receive a link so that I can play the repeat. I am not generally keen on texting and mobile telephones, but twittering gives me more control. No more bleeps from my mobile. You do not even need to sign in to the Twitter site in the usual way to get your tweets. Just sit at your computer and you will see the Tweets arriving in a long stream in your Favourites folder.